On May 12th 1994 the Labour Party leader John Smith died of a massive heart attack at the age of 55. At the time Labour had a 23 point lead over the Conservative government in the opinion polls, and Smith was seen as an honest and organised alternative to the outright lies and absolute chaos of the John Major administration. Smith wasn't just a good leader who unified the Labour Party, he was also a very intelligent man and an engaging public speaker too. These days practically every speech a politician makes ends up on Youtube, Facebook or Twitter, but Smith died before the Internet age, meaning that many of his speeches haven't even been transcribed onto the Internet, let alone posted onto social media. The main part of this article will include quotes from a John Smith speech entitled "Reclaiming the ground" that he read at the R.H. Tawney memorial lecture in March 1993. None of these fantastic quotes have appeared on the Internet to date. 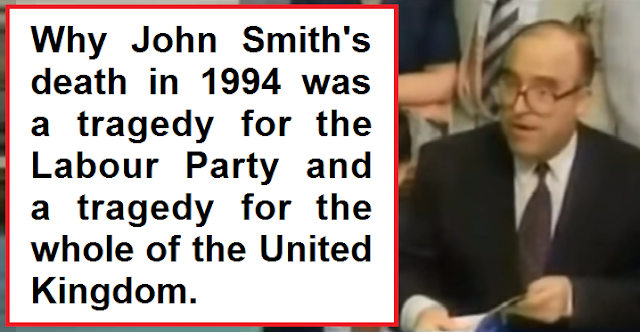 The concluding part of this article will explain why John Smith's untimely death was a tragedy for the Labour Party, and a tragedy for the United Kingdom as a whole. Quotes from "Reclaiming the ground"
"Let us not deny the tide of opinion, which I believe is beginning to flow towards a recognition of the value of society and away from the destructive individualism of so much of modem Conservatism ... Arid at a time when the moral values of our society are coming under increasing strain, we could be taking the first steps in a social revolution by encouraging, through conviction and example, a return to the standards of integrity and honour our society deserves." "We must never be afraid of saying that we will adopt a policy because it is, quite simply, the right thing to do." "Despite the considerable electoral disappointments that many parties of the Left have experienced in Western democratic societies throughout the 1980s, there remains strong public acceptance for many of the principles and achievements of democratic socialism. I am thinking in particular about the National Health Service in Britain and the framework of social and employment rights that are widely supported in most countries in Western Europe." "Real freedom depends on the interdependence of the individual and society, and why this idea - which has long remained at the centre of democratic socialist thinking - retains Its intellectual force and its capacity for popular appeal." "The flaws in the doctrines of the radical right are becoming more widely appreciated and more easily exposed than ever before. Their vision of humanity consists of individuals as decision-making units concerned exclusively with their own self-interest, making transactions in a marketplace. It is a theory that makes very ambitious moral and economic claims, for example, that it alone preserves freedom and promotes prosperity. I believe however that it is a doctrine based on an absurd caricature of human behaviour, which grossly misunderstands the nature of freedom, and seriously ignores the value of society - even to the extent of denying its very existence." "The fundamental flaw in the individualism of the classical writers, and their modem counterparts in today's Conservative Party, is, I believe, their assumption that human beings conduct their lives on the basis of self-interested decisions taken in radical isolation from others. This thesis grotesquely ignores the intrinsically social nature of human beings and fails to recognize the capabilities that all people have to act in response to commitments and beliefs that clearly transcend any narrow calculation of personal advantage." "Providing perhaps unexpected support for this line of argument is none other than Adam Smith who, in the Theory of Moral Sentiments, wrote: 'How selfish so ever man may be supposed, there are evidently some principles in his nature, which interest him in the fortune of others, and render their happiness to be necessary to him'. The fact that this insight of Smith's Is difficult to reconcile with his later and more famous study of economics has caused many of his recent followers to overlook his earlier work. Just as they also tend to ignore his support for public investment in infrastructure, in education and the arts, which are hidden gems of intervention that can be found alongside his thesis of the invisible hand in the Wealth of Nations." "Markets do not enjoy the total supremacy that is envisaged for them by neo-classical economics. Market systems, whilst remaining an effective and useful means of enabling choice and distribution of myriad goods and services, exist alongside and are embedded in other social and political institutions which also contribute to human welfare, and which themselves shape and modify the way markets actually work." "What R.H. Tawney realised was that meaningful freedom depended on real ability. That for millions of people citizenship was empty and valueless if squalor and deprivation were the reality of a society only theoretically free. What was needed was positive liberty - the freedom to achieve that is gained through education, health care, housing, and employment. An infrastructure of freedom that would require collective provision of basic needs through an enabling State. It is this richer conception of freedom for the individual in society that is the moral basis of democratic socialism." "The undermining of local government (which is part of the deliberate down-grading of all alternative power systems to the central State) means that communities are being weakened by having no means to advance their own ambitions and to tackle their own problems in their own way." I urge a renaissance of local government in the context of a more pluralistic and diverse society. It is why I believe that devolving power from an over-centralised Westminster and Whitehall to Scotland, Wales and the regions of England is a necessary part of the refurbishment of our democracy. Democracy has to be a vital and constantly refreshing element on our socialism." "There is no good reason why Britain should not have emulated the achievements of the Scandinavian countries which, profoundly influenced by their social democratic tradition, have set standards which in recent years our country has fallen well below." "There is so much of good that can be done if we seize the opportunities which the modem world makes available. Instead of carrying the miserable burden of mass unemployment, we could be investing In new technology and in new skills. Instead of witnessing the crumbling of our education system and the fracturing of our health service, we could be building high-quality public services which provide security and opportunity for every family in the land. Instead of allowing our society to become diminished by the violence and dishonesty of crime, we could be building strong communities which provide protection for every citizen. Instead of savagely increasing unfair taxes which will further damage so many lives, we could be investing in people, investing in infrastructure, investing in manufacturing Industry. There is so much we could do. There is so much that needs to be done." As you can see from the quotes above, Smith was an intelligent and articulate man who cared deeply about the whole of society. Had he lived to lead the Labour Party to triumph at the 1997 general election he could have decisively rejected the hard-right economic agenda of the Tories and set the United Kingdom on a radically different course towards a more democratic, and more equal society, where the wealth of the nation was harnessed to provide opportunities for all to success, rather than being siphoned off to further enrich a tiny super-rich minority as it is now. The great tragedy is that this man of such principle and integrity was succeeded by the self-serving opportunist Tony Blair, who did follow through on some of Smith's favoured policies (such as devolution, investment in education and the health service, and combating poverty) but who also made an agreement with the right-wing propagandist Rupert Murdoch that he would not reverse the hard-right privatisations and financial sector deregulations of the Tories in return for support from the Murdoch propaganda empire (The S*n, News of the World, Times, Sky TV). There's absolutely no way that John Smith would have supported the catastrophic invasion and occupation of Iraq, and there's no way that he would have supported a Labour government adopting the right-wing economic madness of PFI alchemy schemes (bribing private companies to build public infrastructure, then paying them 5x, 10x, 20x the construction cost in order to rent it for the next couple of decades). Had John Smith lived to win the general election in 1997, he would have begun properly reversing the worst aspects of Thatcherism. Instead of inheriting Thatcher's throne and occupying it for his own benefit like Blair did, Smith would have restructured society in order to re-empower individuals and local communities. Putting the catastrophe of the Iraq war aside, it's undeniable that Tony Blair achieved some significant things - like saving the NHS from the ideological ruin the Tories had been steering it towards, significantly reducing child poverty, introducing the minimum wage, the Irish peace process, and devolution for Scotland and Wales. The problem was that he didn't steer the country away from the radical hard-right economic dogma of the Conservatives and prove that there was a better way. In fact he sat idly by as the country drifted towards the social and economic ruination of the bankers' crisis that blew up in Gordon Brown's face and handed the Tory rabble an unexpected route back into power to continue the fanatical hard-right economic agenda that should have been killed stone dead in 1997. 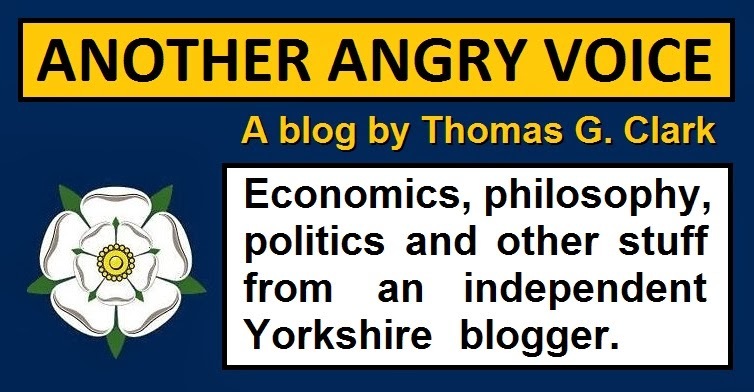 Had Smith reversed the flow instead of simply going along with it like Tony Blair did, the Tories would have been forced to reappraise their hard-right fanaticism and develop a more socially responsible form of conservatism (like the 19th Century one-nation Conservatives, or the Christian Democratic Union in Germany). The reason the UK is now facing the horror of an economically and socially ruinous hard Brexit led by the most savagely right-wing authoritarian Prime Minister in living memory is that John Smith never had the opportunity to decisively prove integrity and democratic socialism to be superior to opportunism and hard-right economic dogma. 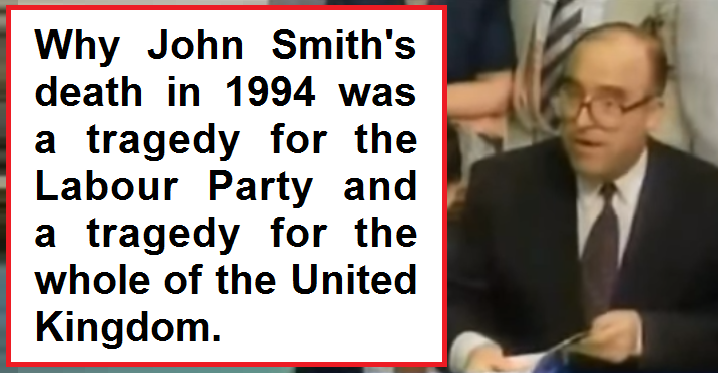 Sadly John Smith died at the age of 55 and then his successor Tory Blair went on to completely destroy the idea of integrity in high office with his self-serving behaviour and the outrageous deceptions he used to con the nation into going along with his plan to invade and occupy Iraq. Instead of reversing the hard-right neoclassical dogma, Blair simply softened the edges of it and then kept the seat of power warm for the Tories. That's why Margaret Thatcher once quipped that Tony Blair and the New Labour project were her greatest achievement in politics, because unlike an awful lot of wishful thinkers on the left, she saw Tony Blair as the ideologically indifferent self-serving placeholder he was. She would never have seen John Smith that way.